The 100% Crystal Clear sealant and adhesive for applications where looks matter. Great for bonding glass to glass, or anything requiring invisible sealing and bonding with a transparent product. Can be used for food-safe applications. Super clear appearance means invisible bonding and sealing! Connection joints in sheet metal fabrication, sealing of air conditioning systems. Bonding of security and safety glass. Supple bonding in car bodies, caravans, containers. Why is Soudal’s Hybrid Polymer Technology better? Go back to the Fix All landing page to learn more. 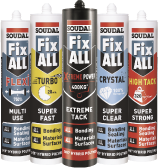 © Copyright 1978 - 2019 PFE Technologies Pte Ltd. Soudal and Fix All are brands of Soudal NV.